The brevity of the tales only heightens their power: you’re plunged into unfamiliar situations, grasp the essence of the moment you’ve fallen into, and are then ejected back out again, gasping for breath. Teamwork is a dizzying example of this, where we come round alongside Maurits, who seems to be in the midst of a game where he has to follow the instructions of a voice inside his head. Adding a layer to the complexity, Maurits can only see from the viewpoint of apparently another player, who he in turn is attempting to guide. It’s claustrophobic, tense and arguably a work of genius – Pinnock is able to take our weirdest dreams and nightmares, and pin them to the page in a way that makes sense, at least as far as the confines of each story allows. There’s tenderness in this collection, cleverness, wit and the sheer joy of an unrelenting imagination. Dip in – you won’t be disappointed. 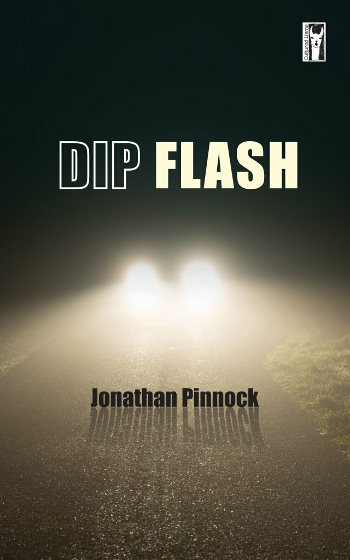 Dip Flash by Jonathan Pinnock is published by Cultured Llama and is available to buy from Amazon. This entry was posted in Reviews and tagged Cultured Llama, Dip Flash, flash fiction, Jonathan Pinnock, short story collections by Judy. Bookmark the permalink.